Reverie Nail Lacquer may sound like a brand new indie, but they simply an old favorite in disguise. If you have ever seen or used Two Gypsies Nail Lacquer, they are one and the same. Today I have the Summer 2014 collection which consists of a couple jellies and a LOT of glitter. Seascape is a cream crelly with gold shimmer, hex and dot glitters in various shades of peach, yellow, and blue. The formula was a bit thick, but it was simply because it is jam packed with glitter. I found it a bit difficult to apply with the mini brush. The formula itself felt like a workable consistency, so I am almost certain it was the brush. I was able to achieve full coverage with three coats, and a little bit of glitter manipulation. Agave is a pale blue-grey crelly with tiny copper and golden flakies. The formula was a nice consistency and applied evenly with each coat. At two coats it almost reached full coverage, but I decided a third coat was necessary so that you could get the full effect. This is a polish that I never knew I wanted, but now that I have seen and worn it, I don't think I could live without it. Orchid is a pale purple-pink base with a slight golden shimmer and a subtle holographic sheen in the sunlight. The formula was a nice consistency and applied evenly. I was able to achieve near full coverage with three coats, but you could still faintly see the nail line if you looked closely. Orchid could be worn as shown or over another color for an extra sparkle. It isn't super thin, but I think a dark purple or black would really make it pop. Summer Wine is a bright red jelly with pink, red, orange, yellow and iridescent hex and dot glitter. Pictured above is three coats with no base color. The formula on this was a bit thick because of the glitter content, but the jelly itself was very workable. I had issues applying the glitter with the mini brush, so I used the dab on method once I established a basic coverage. I think this color would be very easy to work with if you used a full sized brush. I wasn't entirely sure how I felt about this color in the bottle, but once it was on my nails I fell in love. The fact that she stuck with one portion of the color wheel intensified the impact of the color as a whole. I couldn't stop thinking about a cool glass of sangria while swatching it. Andromeda is a deep blue-purple jelly with hex and dot glitter, two different sizes of stars and tiny iridescent bar glitter. The formula overall was a bit thinner than Summer Wine because of the lower glitter content. The jelly portion of the composition is fairly close, if not the same as Summer Wine. This was a bit easier to work with because of the lower glitter content, but still difficult with the mini brush. It took three coats to get an even coverage of base color and glitter. I was pleasantly surprised that I did not have to fish for star glitters. They came out willingly, and even in small clusters. If I didn't know better, I would have thought they were trying to form a small solar system on my fingers. 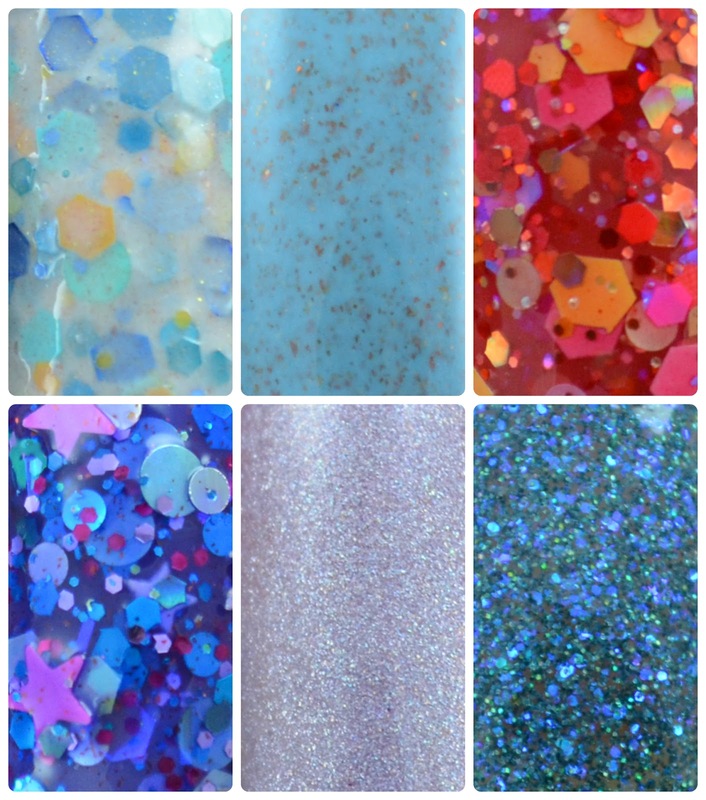 Mermaid Scales is a sparkly teal micro-glitter bomb with holographic and iridescent glitters. 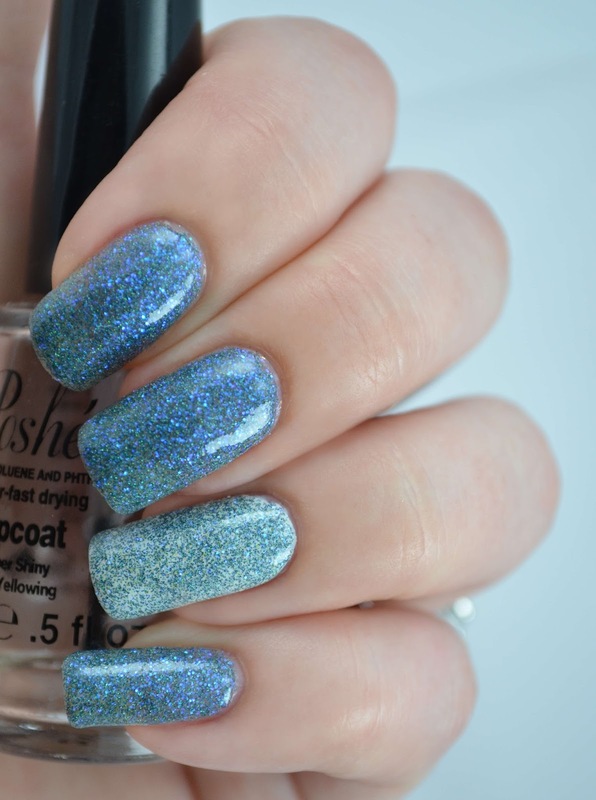 Pictured above is three coats with no base color, and an accent nail featuring one coat of Mermaid Scales over white. The formula was just thick enough to keep glitter well suspended without being too thick to apply. I was rather surprised at how much coverage this gave with just three coats. This color is absolutely stunning. This collection is incredibly cohesive while standing out from the crowd. It would be incredibly hard to pick a favorite, but Agave really spoke to me. The other five colors come in close second. I don't usually care for all of the colors in a collection, but this one certainly won me over. Reverie Nail Lacquer's Summer 2014 collection will be available on Wednesday, June 25th at 10am EST. If you wish to pick up one or more colors please follow the links below. Some nice colors from this brand! Summer Wine looks incredible on you! Agave is a really cool color, not one that I'd pick based on bottle shot alone but I really like the way it looks on the nail. All of your swatches are gorgeous, as always. I definitely like their re-branding.